From top to bottom, Legolas, Frodo, and Aragorn on 1/28/06. 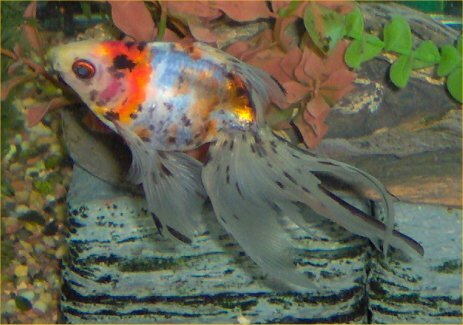 For information about the indoor goldfish that I had years ago, go to this page. 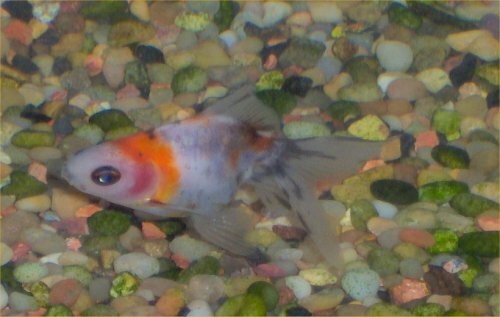 My last indoor goldfish, Legolas, a male fantail, died on 6/4/14. 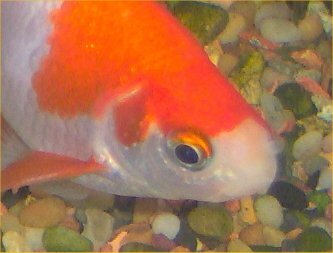 Here is the history of my most recent indoor goldfish. 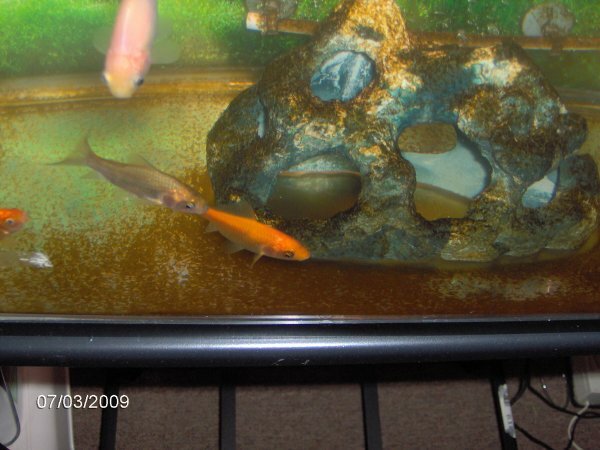 On 1/22/06, around 9:30 am, I moved my three fantail goldfish from my 20 gallon basement pond where they had resided since 11/5/04. They were probably born in early 2004. You can read more about the move preparations, etc. on my 40 gallon tank page. 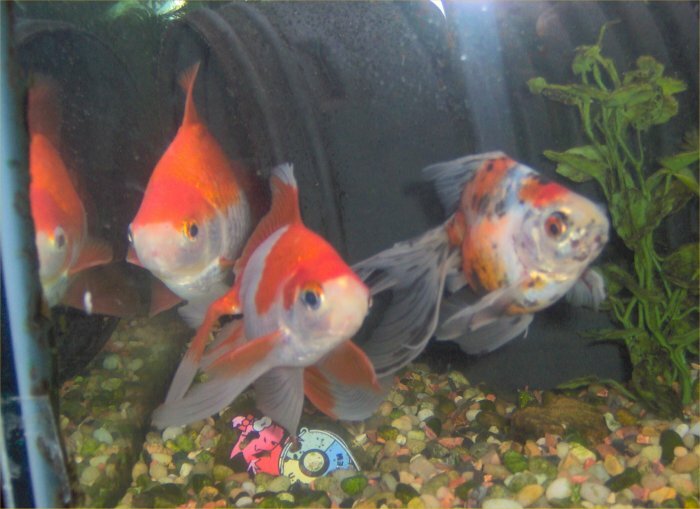 I named the three fish after some of the main characters from Lord of the Rings since I watched all three of those movies a few months before I moved the fish who had never had names. 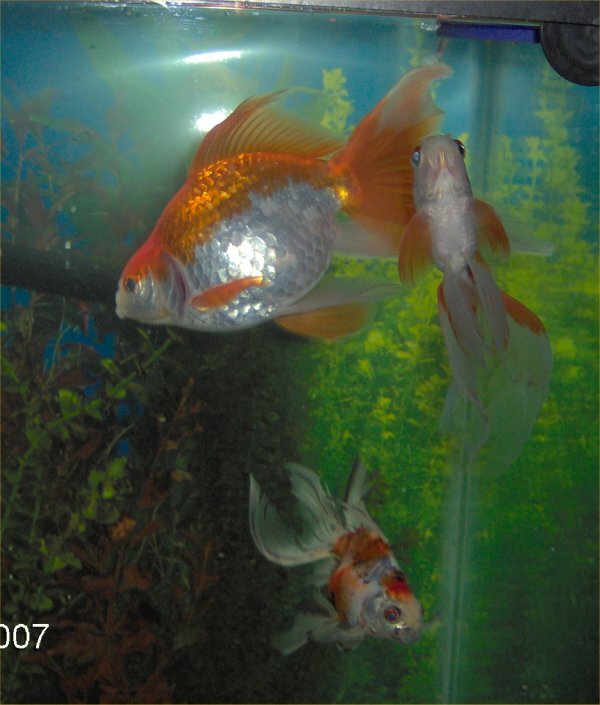 Aragorn was the largest at the time, a white and orange fantail almost 3" at the time of the move. Legolas was the next largest, also orange and white but with less orange than Aragorn. Frodo was the tiny one, a calico fantail, just a few inches long. 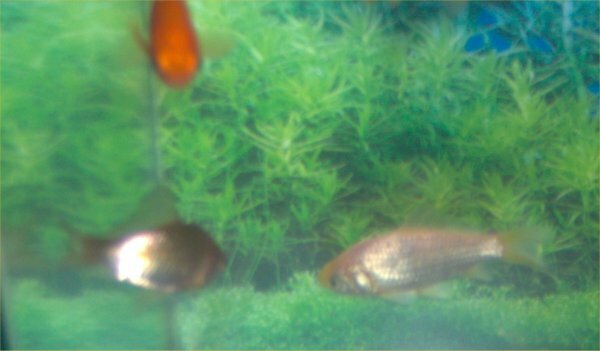 Both Aragorn and Legolas sprouted tubercles about four days after moving them into the 40 gallon tank. I never thought they could be sexed so young! 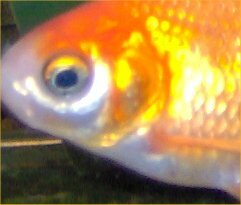 By the second week of February, it seemed that Frodo also had tubercles just showing, at least on one gill (the white one and not the clear one). So, unless females can have tubercles, which I have not heard of, I had three boys. At least, I picked all boys names and got that right. I would not have to worry about babies but did worry that males may beat up on each other a little due to their desire to spawn with someone [Update 2014: The boys never faught]. 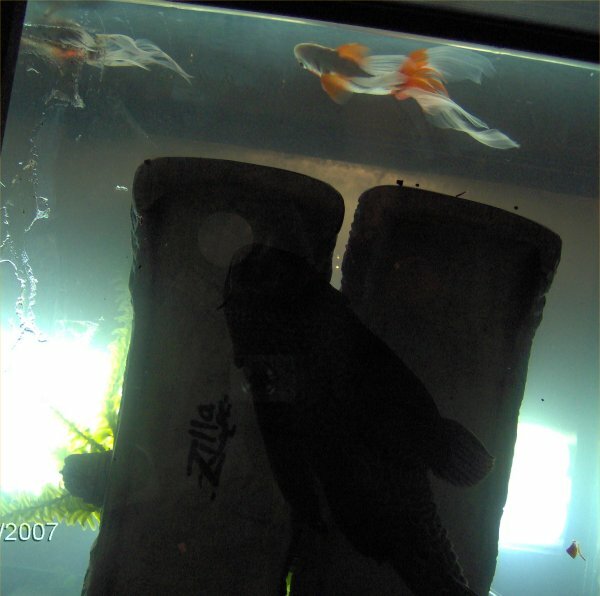 On 3/18/07, I tore down the 40 gallon tank that my three fantails and plecostomus were living in and set up a new 65 gallon tank. It developed a crack so, two days later, I moved the fish back to the 40 gallon tank. Details to be found on the tank redo page. 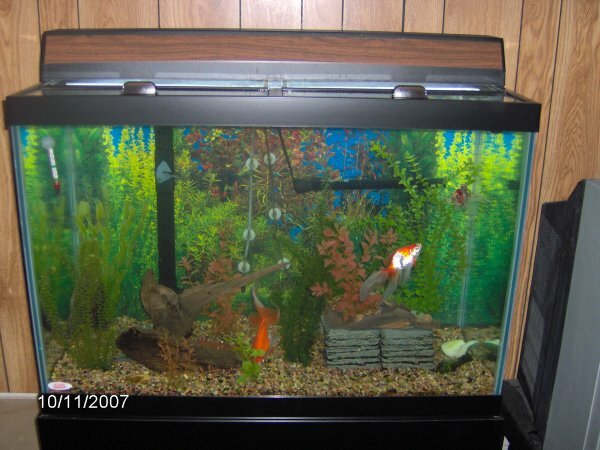 The store made me buy another tank which I finally set up on 3/31/07. The goldfish and Plecy were finally in the 65 gallon, hopefully, this time to stay! As of March 2007, Legolas was the largest at 5 or 6 inches long, Aragorn was about 4 inches, and Frodo was maybe 3.5 inches. Those were estimates as the fish did not sit still! By 11/13/08, the three boy fantails were still fine. They were actually about the same size as they were in the previous mention. 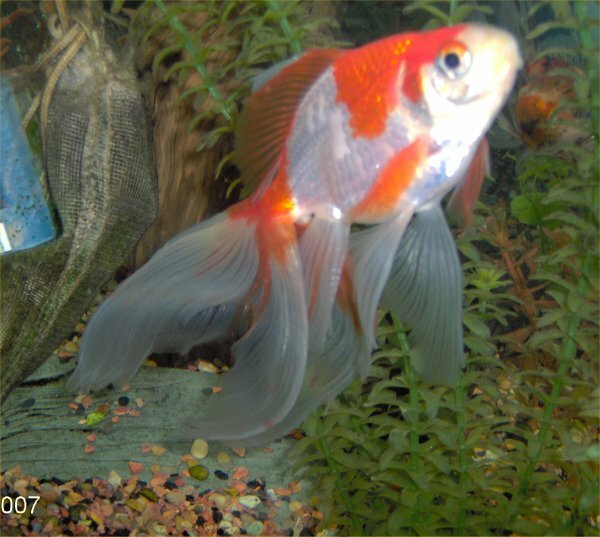 Aragorn had the longest fins. The boys spent more time just laying around then I would like but otherwise seemed fine. 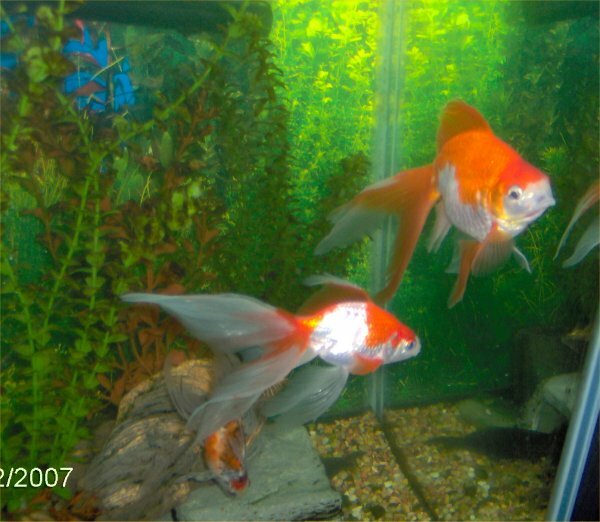 By 2009, the boys were showing signs of fish tuberculosis. Aragorn had no obvious tumors but laid around sometimes and had some septicemia. 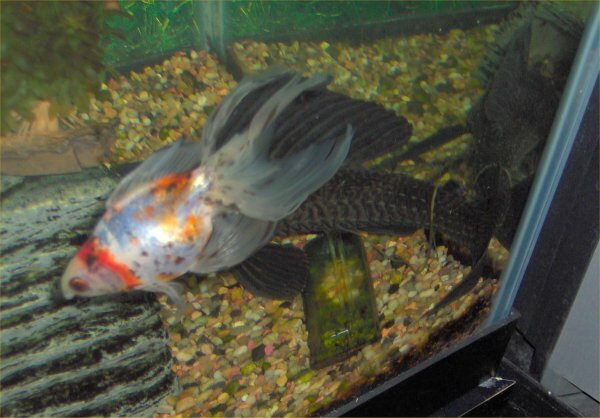 Legolas was the largest and had a small tumor next to his dorsal fin. I thought Frodo was okay but, then on 10/3/09, after he had been a bit lethargic, I found the reason. A tumor ruptured through his vent. 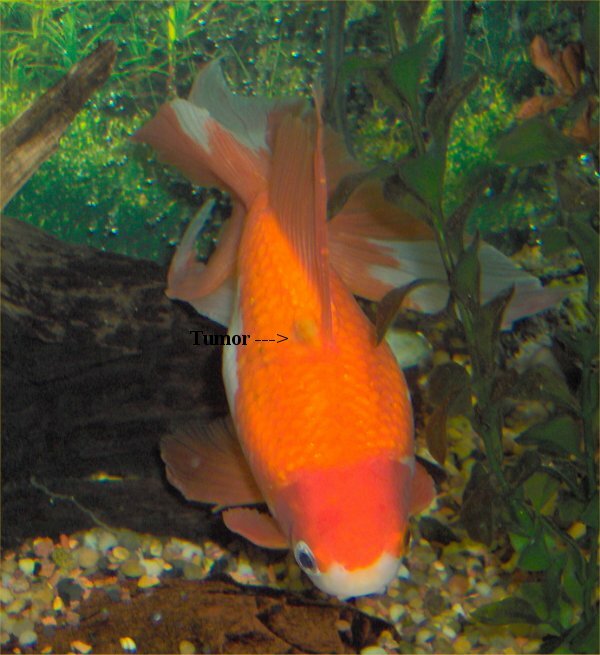 I had assumed his round tummy was just fantail body shape but there were tumors in there. The poor little guy must have been in pain. 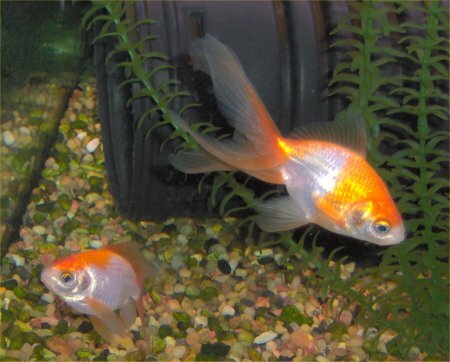 I did not know what to do for them since no previous fish tuberculosis treatments have ever worked. They probably got the fish tuberculosis from Plecy who was previously with goldfish who had it. Plecy is apparently immune from its affects himself. I wish I knew his secret! Frodo spent the last few days of his life floating around. He was alive the evening of 10/16/09 and gone in the morning. His tuberculosis tumor ruptured out of his body. There are photos below. This disease is so insidious. I buried Frodo. Aragorn was lethargic and a bit anorexic. 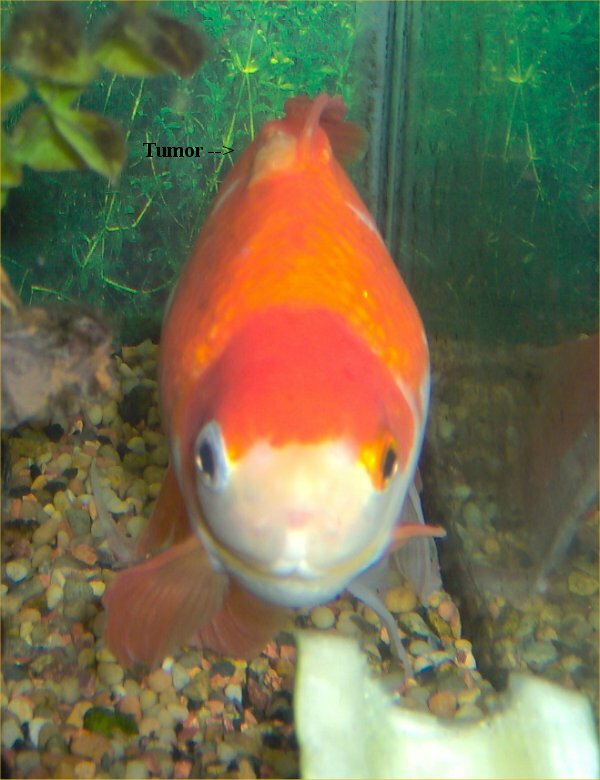 Fish TB can cause either tumors which make the fish huge or anorexia which is a paradox. 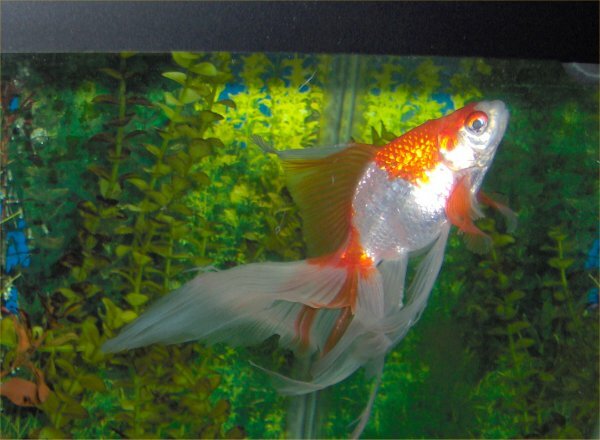 Legolas was huge and active but he did have a small tumor by his dorsal fin. Plecy had no problems. This time around, I would not add any more fish until the remaining three have passed on. Then, I can sterilize the tank and hope that future fish will be safe. Poor Aragorn died on 12/25/10. Legolas was large and seemed healthy except for an open tumor on his back. I finally was able to bury Aragorn on 2/27/11 since the ground had been frozen for two months! Update 1/13/12: Legolas is actually doing well. His tumor healed itself! He is big and slow but seems okay. Update 1/23/14: Legolas has continued to do well. Sometimes he will end up upside down. Sometimes he will seem to get a small tumor but they then heal over. Perhaps Plecy gave him his magical powers! Lego is going to be 10 years old this year! Wow, I guess he is now my oldest ever goldfish! 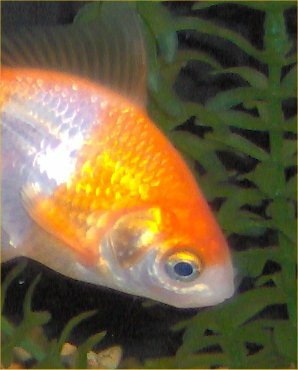 And, he is will Plecy, my oldest fish ever will be 20 years old this year! Lego died on 6/4/14. He developed dropsy the last few days of his life but, otherwise, his death was quick and unexpected. His body was 5.5" long and with his tail, he was 9" long. A video of my three fantails can be seen on my video page. This section is about recent goldfish that were indoors short term before going in to my pond. On 1/02/09, my mother called me at work to ask if she should get live feeder goldfish to feed the great blue heron who looked so forlorn standing on my pond nets. She was afraid he would starve. I told her no way. She asked about dead fish; I told her he would not eat them. She said she was getting the live goldfish. There was no stopping her when she got her ideas. When I came home from work, there were 21 feeder goldfish in a kiddie pool only two feet from my 153 gallon pond. They had been dumped from their filthy 75 degree F water in to 40 degree F clean well water with no aeration or preparation. A few were already dead. My mother insisted the heron was coming. I moved the kiddie pool further away from my pond; the last thing I wanted was that contaminated water in my ponds! That night, it went below freezing. There was half an inch of ice on the kiddie pool. 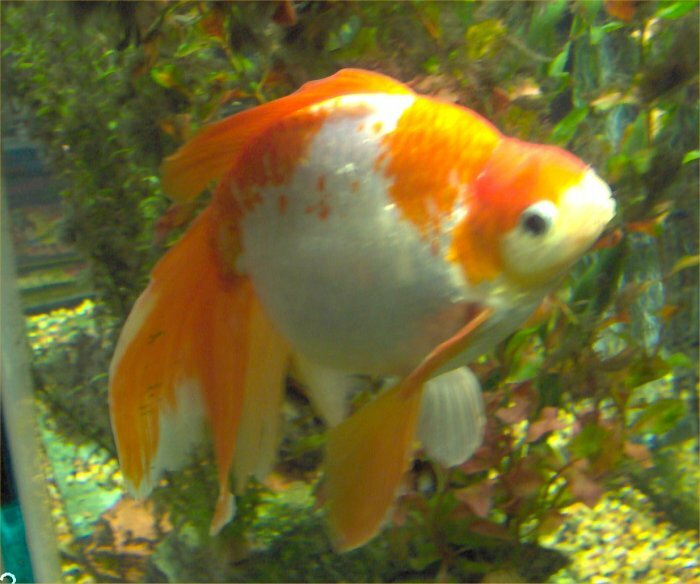 Amazingly, some goldfish were alive. The heron was not around. I just could not leave them there. So, I put on plastic disposable gloves, broke and tossed the ice, and touched each fish. I remove the seven fish who responded. I set up my largest spare aquarium which was only 10 gallons. It included lid, fluorescent light, Penguin Mini filter, a plastic hiding cave, and an air bar. 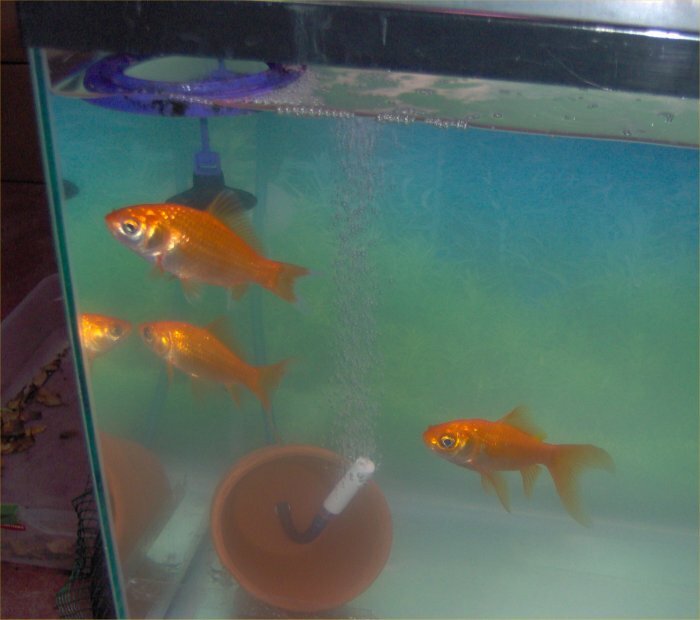 I added only aquarium salt (a tablespoon per 5 gallons), Stress-Coat, and Stress-Zyme at that time. In a few days, I would treat them for ick and bacterial infections. They did not appear to have ick spots, or at least not a lot. They were anorexic as are most feeder fish. Even with treatment, they could still be carrying bacteria, parasites, and so on since I could not treat for everything nor are all treatments successful. Some diseases are latent like fish tuberculosis. Of course, all my fish had already been exposed to that so that did not worry me much. My father said I should have left them out there to freeze to death. My mother said, "After you rehabilitate the fish, you can put them back outside on a warm day for the heron to eat." That made me mad. I was not going to invest all the time and effort to make them healthy just to have them killed. Already 13 fish had died. A few hours later, my mother said, "It's a miracle!" She said two more fish were moving. I brought them in; one died almost immediately (mouth agape, no movement, stuck to the intake; that is dead; I know). Of the eight fish I was now stuck with in a way-too-small 10 gallon tank, five of them were orange, two are bronze (which would eventually change to orange), and one was white. 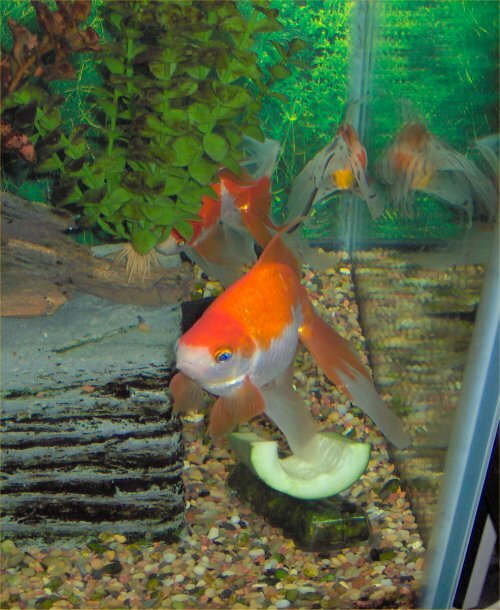 There were fancier common goldfish in the group; they were all among the victims. It was going to be a challenge to keep the ammonia down on this tank; it was overcrowded! What they went through is a lesson in what not to do to fish. How any survived such temperature shock is really a miracle. These were some hardy fish! 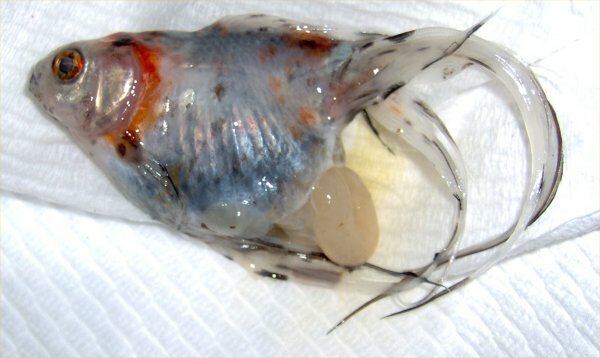 The smallest fish developed white patches, perhaps columnaris or fungus. He also began changing from orange to brown (the opposite of most color changes) but it was definitely a color change separate from the infection. I had treated for the first week with Maracyn I (erythromycin antibiotic), Maracyn II (minocycline antibiotic), and AquariSol (copper-based anti-parasitic). 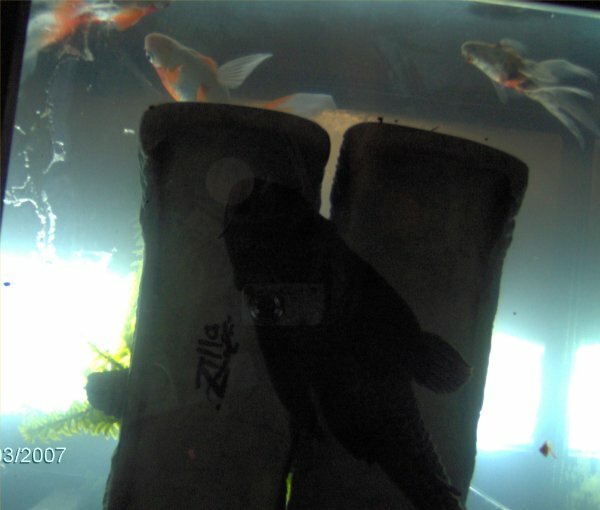 The second week, because this fish was ill, I treated with PimaFix (natural antifungal). He seemed to be getting better but died on 1/16/09. 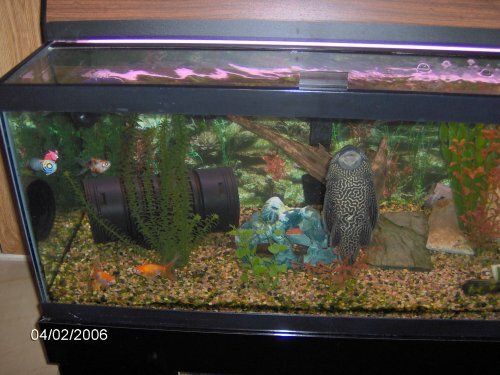 The fish were doing well but one ended up dead on 3/17/09 for no apparent reason. It was one of the orange ones. 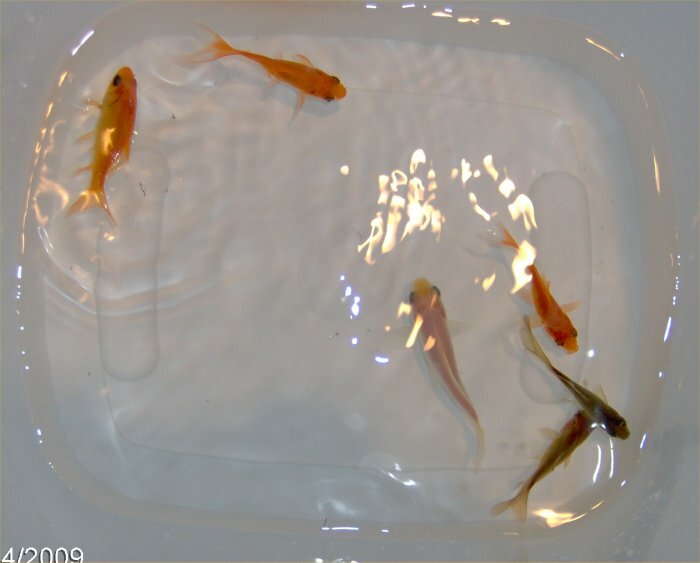 I released the six little goldfish to the 1800 gallon pond on 4/18/09. They were so tiny compared to the other fish so they stuck together and hid under the Cyprio waterfall. I did not see them for sure for two weeks but then saw the white and orange ones (the two dark ones would be really hard to see). They were in a group in the shallows, an un-netted area. And, the heron had been around! I sure hope they hide well! 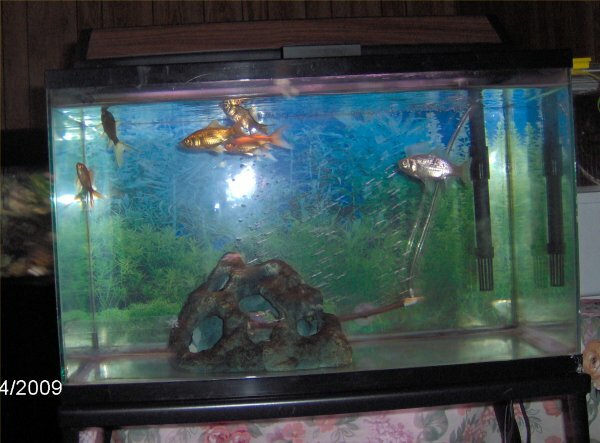 On 10/27/09, I got some fish from Live Aquaria. For the basement pond, I got four bitterlings and two shubunkins. 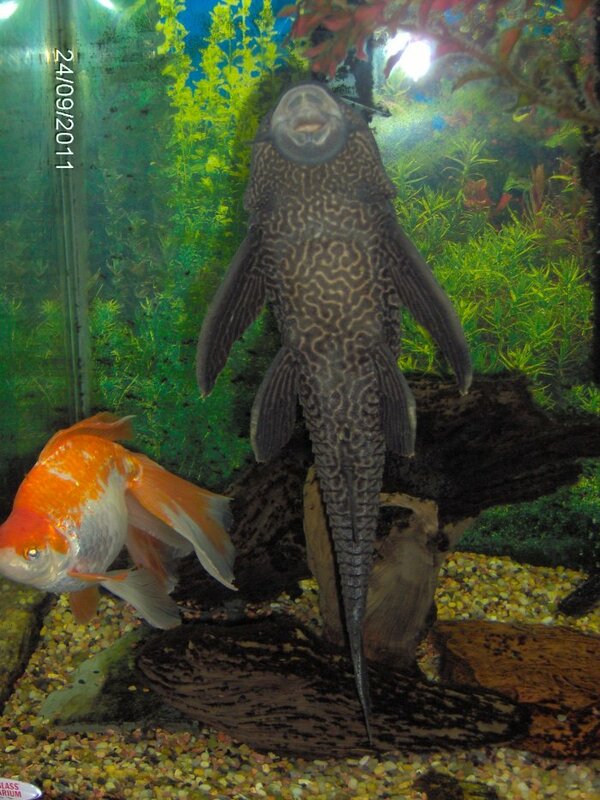 They would go in my 1800 gallon pond next year. These beautiful little goldfish were only about 1.5 inches long and seemed to love the pond and the bitterlings. Unfortunately, on 10/26/09, I found one of the shubunkins on the net of the pond. It jumped out a small hole of which there were many. I tried to close up as many holes as I could but the holes allow the fountain to run and the bluebells to grow there. The one remaining shubunkin may be lonely so I may try to find him a buddy although he likes the bitterling. 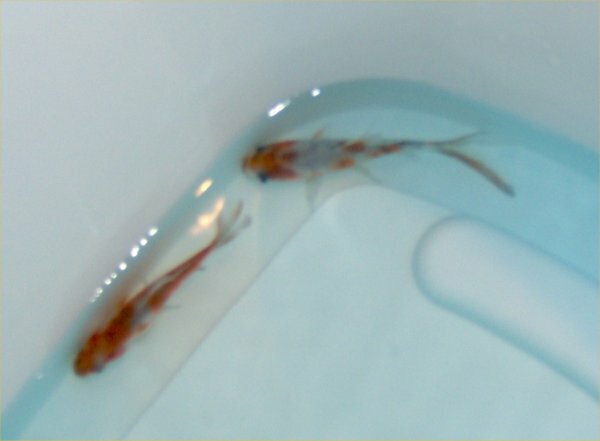 The shubunkin and bitterling were released in the spring of 2010, seen a few times and then never again. I need to stop buying fish! 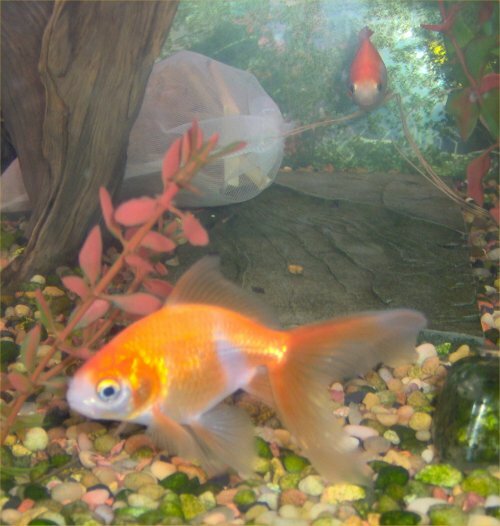 On 5/16/13, I was given a relative's in-law's three ~3 inch goldfish. They were severely neglected and only survived without filtration, aeration, water changes, water additives, etc. 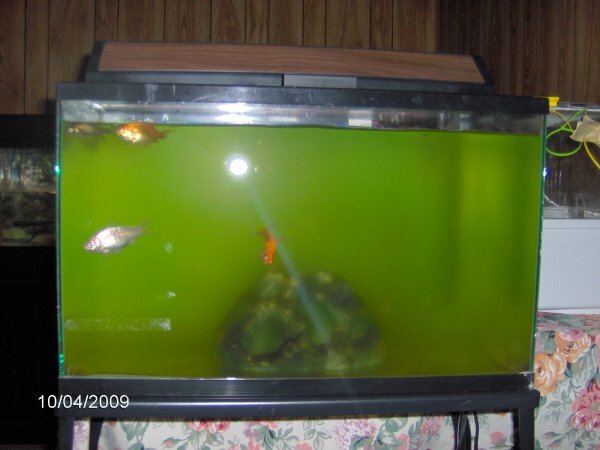 in a 10 gallon tank for a year because they were rarely fed (and the food was rancid). I quarantined them with treatment for a few weeks. I treated them with Maracyn I and Maracyn II for five days and then gave them two doses of Quick Cure. 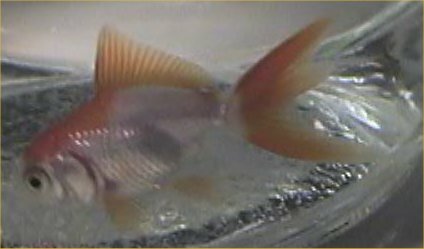 One was a common goldfish that was mostly orange with white tips on the tail fin (named Fargo). 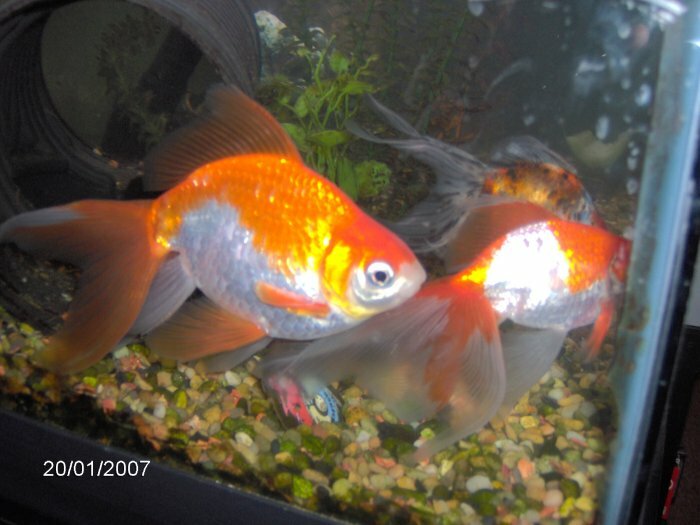 The other two were all-orange comets (named Goldie and Angel by my niece). I released the fish in the 1800 gallon pond on 5/28/13. Four fantails in a small bowl for photos. 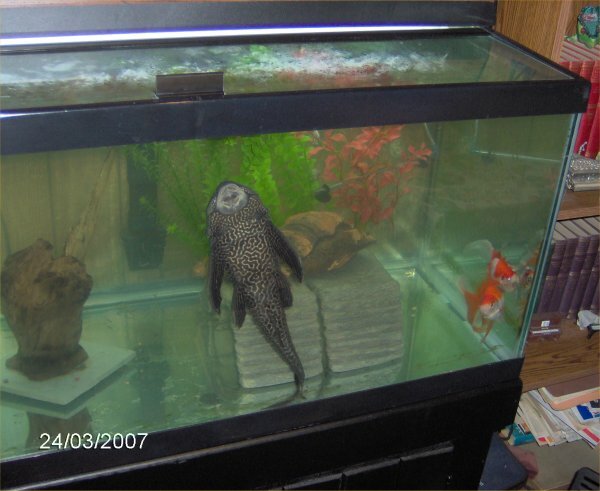 The fish were added to the 20 gallon indoor tub pond on 11/5/04 after this photo was taken. 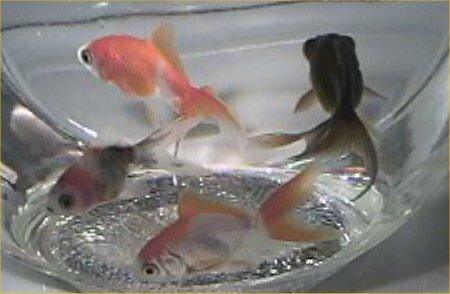 The far left fish is a calico fantail. The upper right fish was a chocolate telescope-eyed fantail but he got sucked into the filter and died the first night (I fixed the problem). 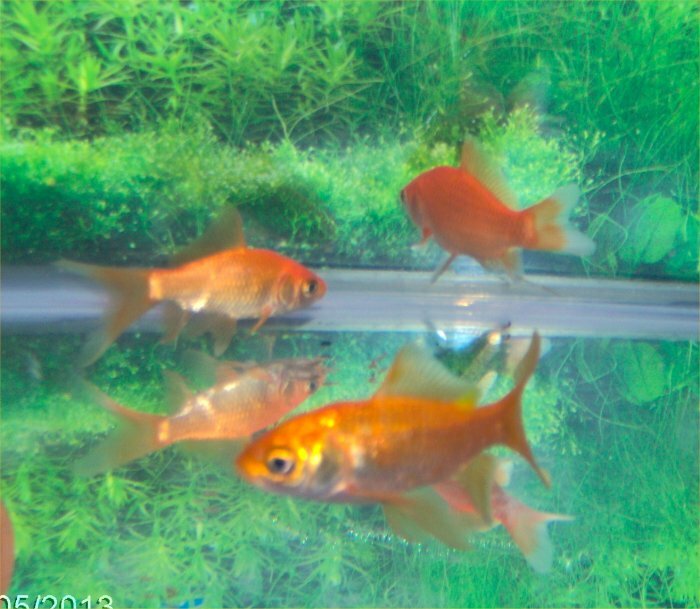 The other two fish are orange and white fantails. The fish were only about an inch long so very young. Legolas (left) and Aragorn on 2/4/06. Close-up of Aragorn's tubercles from the above photo on 2/4/06. 40 gallon tank on 2/4/06 with Plecy and the three goldfish. Aragorn (left) and Legolas on 1/22/06. 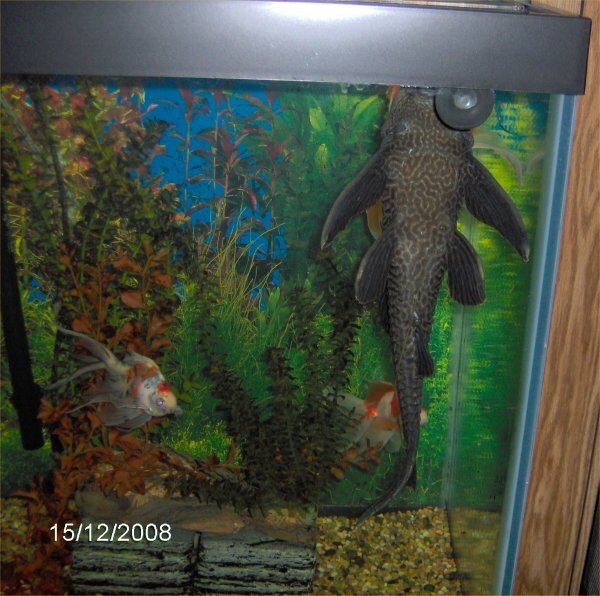 Aragorn (bottom) and Legolas (hiding in the back) on 1/28/06. Legolas (top), Frodo (middle), and Aragorn (bottom) on 1/28/06. Close-up of Aragorn's tubercles, a zoom in of the previous photo. Legolas, Frodo, and Aragorn left to right on 1/20/07. Close-up of Aragorn's tubercules from the previous photo on 1/20/07. Legolas (left), Frodo (back), and Aragorn (right) 1/20/07. You can see how Legolas became twice as big as Aragorn who used to be the biggest. Legolas, Aragorn, and Frodo left to right on 1/20/07. 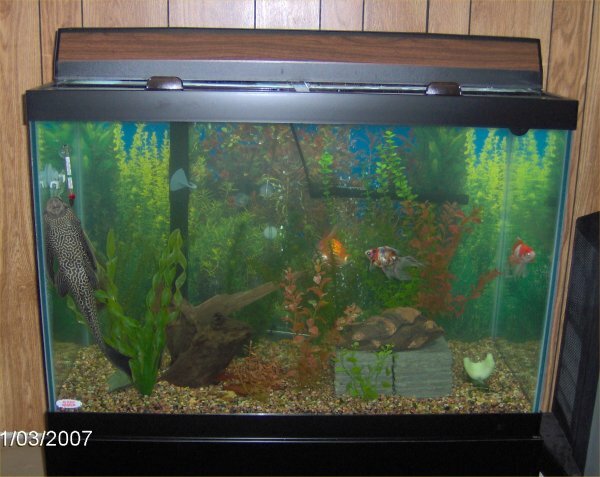 Frodo, Legolas, and Aragorn left to right on 3/17/07 in the 40 gallon tank before I tore it down. Frodo next to Plecy on 3/17/07. Aragorn, Legolas, and Frodo left to right on 3/18/07 in the 40 gallon tank before I tore it down. 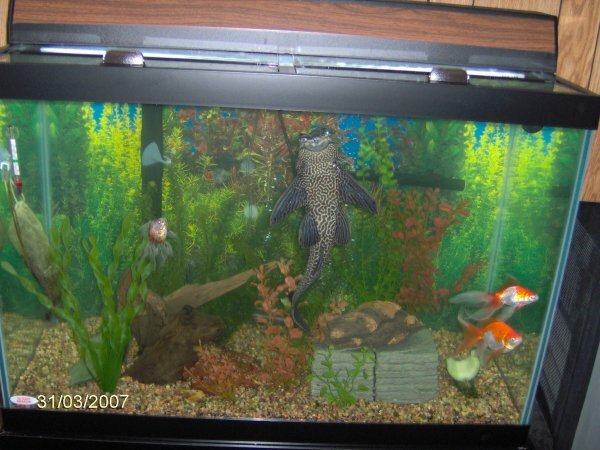 Aragorn, Frodo, and Legolas in the newly setup 65 gallon tank on 3/18/07 before it cracked. See my tank redo page for details. 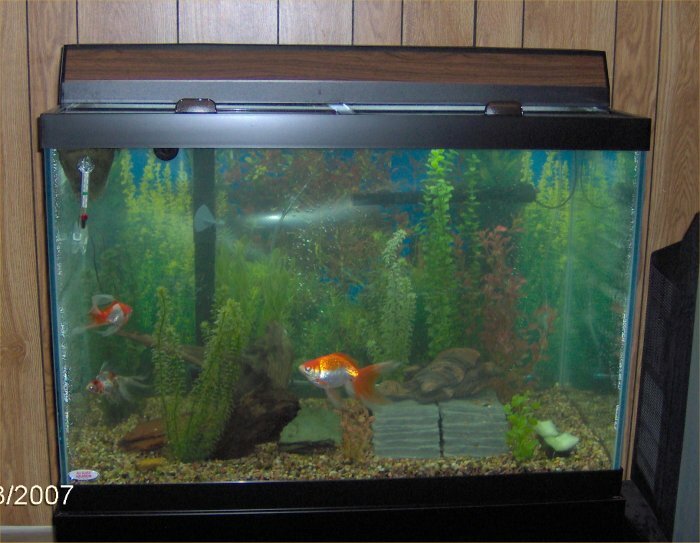 The goldfish were moved to a new 65 gallon tank on 3/18/07 which cracked. 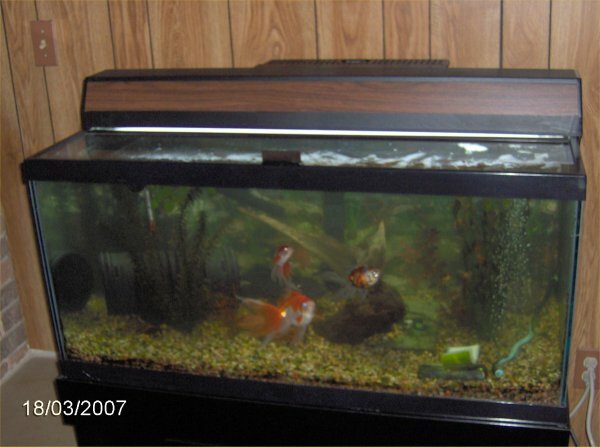 So, they went back to the 40 gallon tank on 3/20/07. I did not move the gravel there but held it in buckets while waiting to get in a new tank (I had to buy two). This day, 3/24/07, I took photos from under the tank, looking up which was unique. 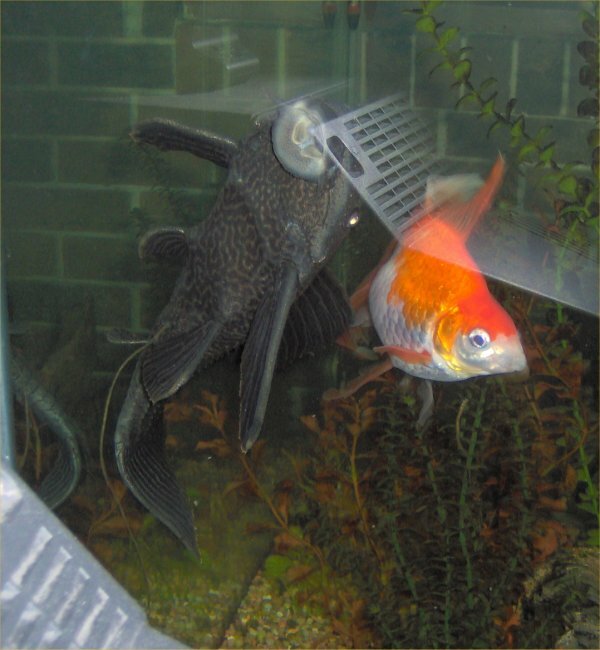 Photo - from below, shows Plecy and the goldfish. 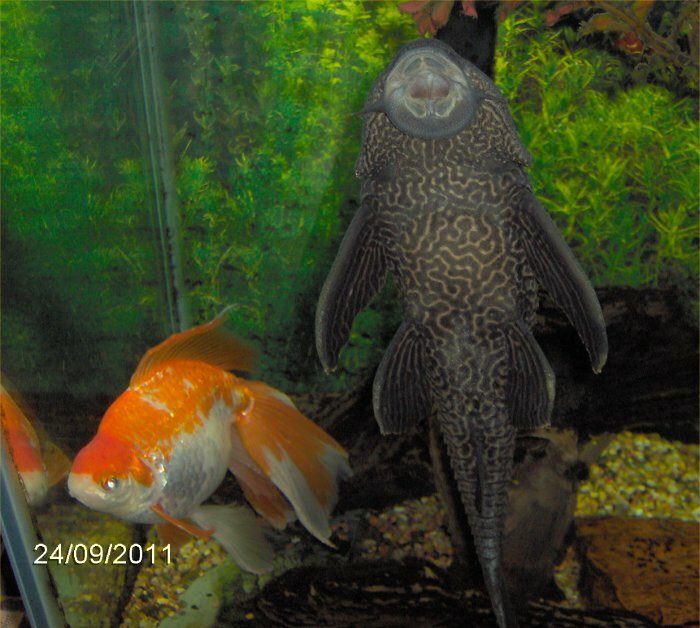 Photo - from below, shows Plecy and the goldfish (Frodo on the right). 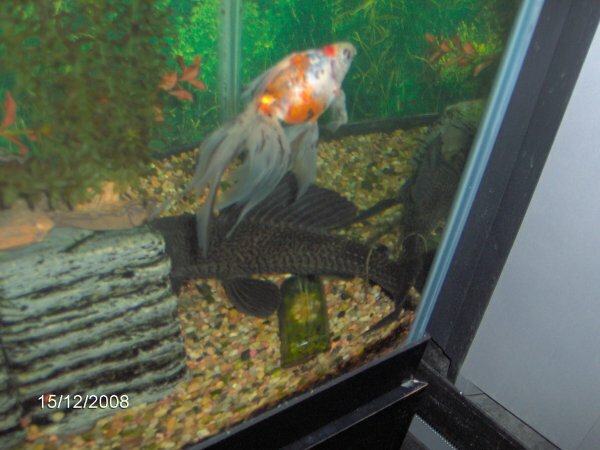 Aragorn and Legolas with Plecy waiting in the 40 gallon tank on 3/24/07. 65 gallon tank - set up the second time, 3/31/07. From left to right are Legolas, Frodo, and Aragorn. 65 gallon tank - set up the second time, 3/31/07. Frodo is on the left. Aragorn is on the right on top of Legolas. 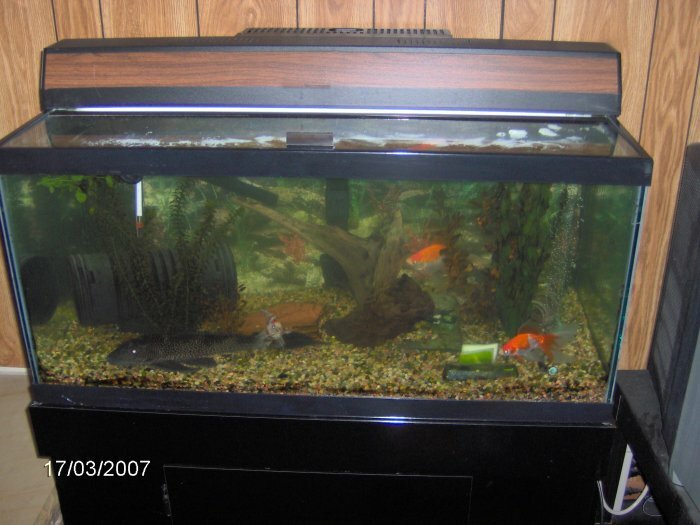 65 gallon tank on 11/10/07. 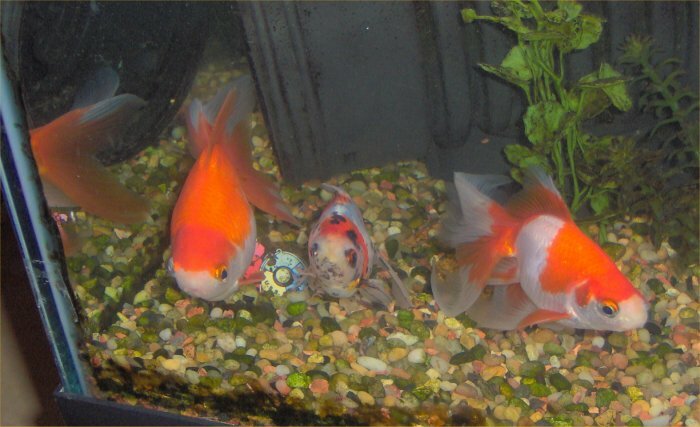 The fish from left to right are Legolas, Aragorn, and Frodo. I had just finished the weekly cleaning but also had bleach soaked and dechlorinator soaked the fake plants so they look more new. 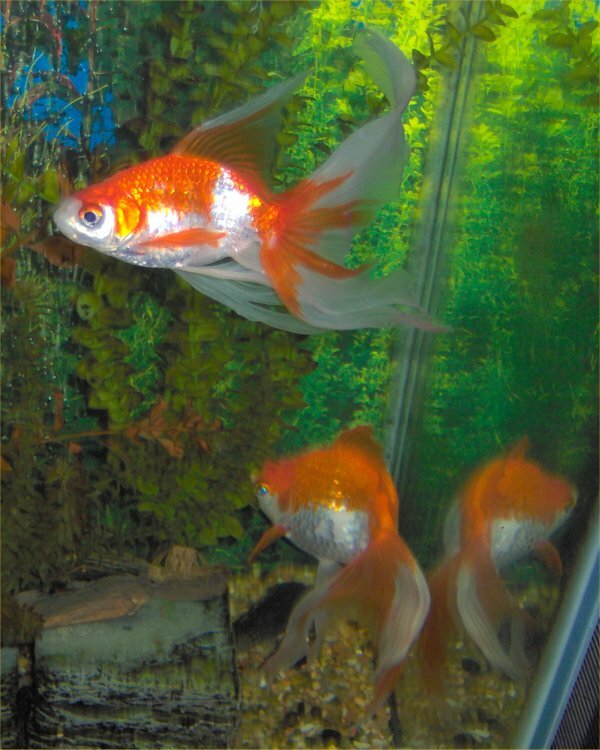 The three goldfish on 12/29/07. Aragorn is on the upper right, Legolas on the upper left, and Frodo on the bottom. 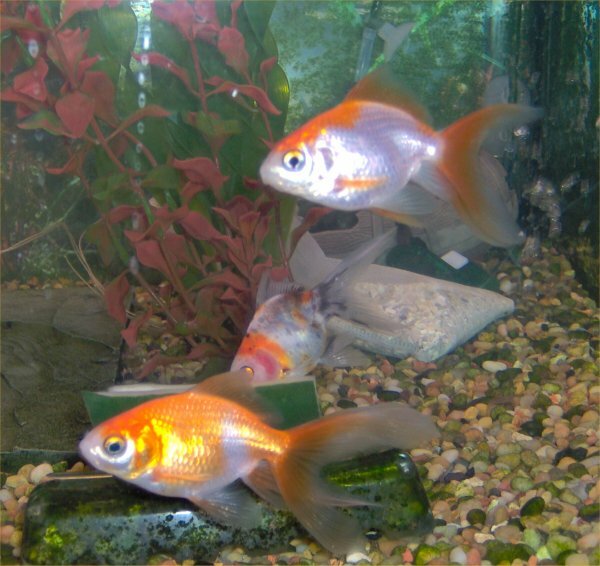 The three goldfish on 12/29/07. Aragorn is in the middle, Legolas at the top, and Frodo on the bottom. The three goldfish on 1/13/08. Aragorn is in the back left, Legolas in the front, and Frodo in the back right. 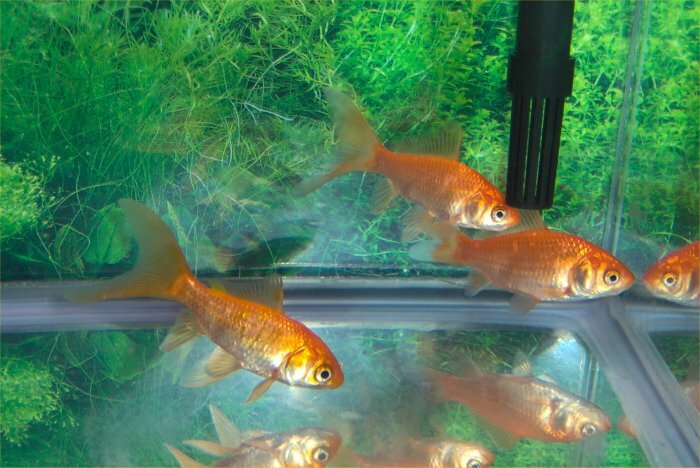 Here are photos of the eight feeder goldfish that I rescued in a 10 gallon tank. 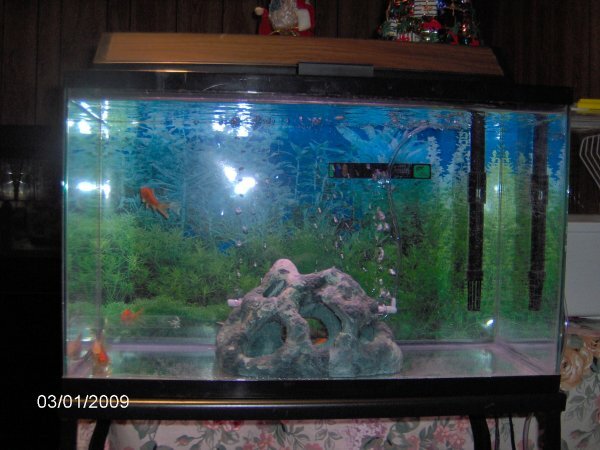 10 Gallon Tank with goldfish on 1/3/09. Goldfish - six of the eight goldfish can be seen plus some of their reflections, 1/6/09. These photos from 1/18/09 who the 10 gallon tank and seven remaining goldfish. Sunlight started to hit the tank. As a result, these photos of the 10 gallon tank show it with a suspended algae bloom and after treatment with an algaecide. Suspended algae bloom in the 10 gallon gallon tank on 4/10/09. Clear tank after algaecide on 4/12/09 so you can see the goldfish. 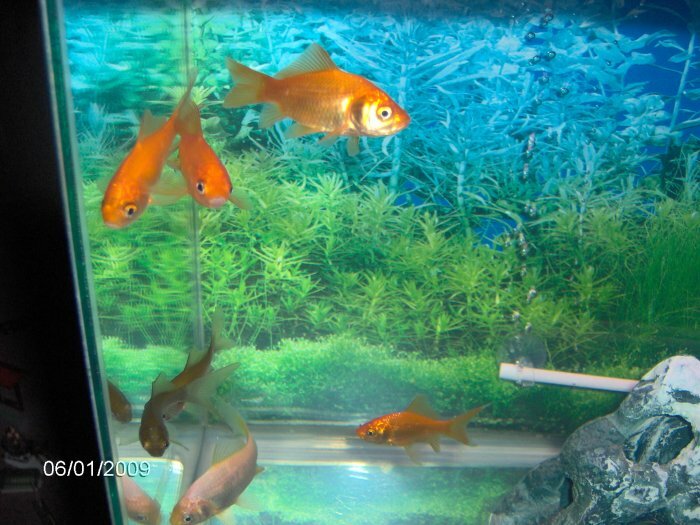 Here is one last photo on 4/18/09 before the little goldfish were released in to the1800 gallon pond. Poor Frodo died on 10/17/09 after his tuberculosis tumor ruptured out his vent. Here are photos of his body. Warning: Do not view these photos if you have trouble looking at dead animals. 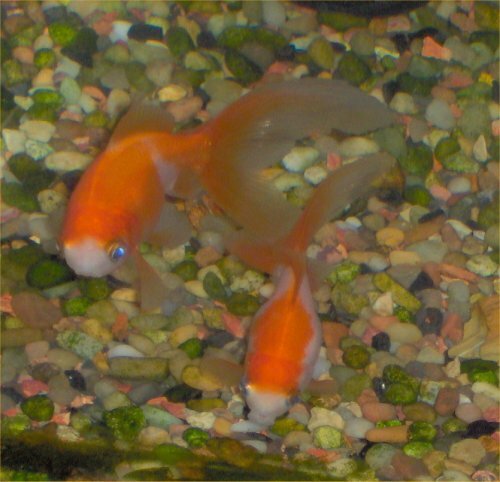 On 10/24/09, I got two shubunkins for my basement pond. Unfortunately, one jumped out two days later through a small gap in the net which I tried to fix afterwards. They are in the water that they came in to which they added some kind of blue stuff. These photos are from 7/3/10. 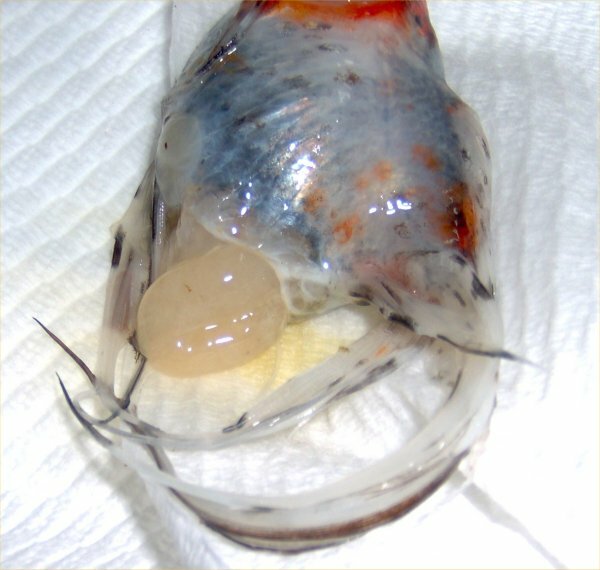 Both fish have lesions. Aragorn has been anorexic for a while. Aragorn with minor lesions along his back. This was his last photo as he died on 12/25/10. Legolas with an arrow towards his dorsal tumor. 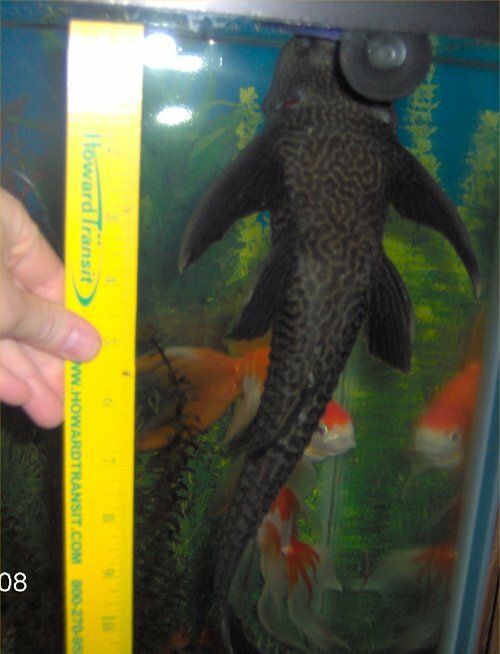 These photos are of Legolas and Plecy (plecostomus) on 9/24/11.